Featuring Andre Canniere, Rebecca Nash, Olie Brice & Matt Fisher. With an invigorating spirit embodying the sequential, macrocosmic concept of ‘order, unpredictability, then descent into disorder’ (originally launched and explored in the debut album New Era), London-based alto saxophonist Dee Byrne’s five-piece Entropi continue their extra-terrestrial flight with Moment Frozen – a sweeping sequence of eight original compositions again frequently inspired by galactic and chronometric themes. The band’s now-established personnel is completed by Andre Canniere (trumpet), Rebecca Nash (piano/keys), Olie Brice (double bass) and Matt Fisher (drums). Outlining the background to this project, Byrne poses the question: “If order eventually always turns to chaos on macro and micro levels, how can we translate that into something meaningful in our lives? The album title is a statement that our lives are made up of a series of snapshots. If we hold each of them up to the light, are we happy with the sum of all these frozen moments which, together, make up the sum of our existence?” Entropi have already forged a sparky signature sound, their combined goal of breaking into new orbits lifting both fierce and nebulous extemporisation from the written page. It’s an effective balance which is as much due to Dee Byrne’s compositional generosity (born out of her eclectic musical collaborations in Western Europe, en route to gaining a Masters at Trinity Laban) as the seemingly inexhaustive, searching intent of her colleagues. The quintet’s two-horn solidity is finely wrought, featuring bristling unison riffs and harmonic collisions, yet Byrne’s and Canniere’s breakaways into freely improvised hyperspace also find an empathetic, textural connection with the rhythmic and chordal probings of Nash, Brice and Fisher. Indeed, as Dee elaborates on the band’s founding vision, “I was always looking for the intensity of John Coltrane’s quartet and the later Miles Davis groups, taking forward something of their 1960s spiritual depth and energy into our own, progressive experience. Music is a healing force – I feel very much in tune with that concept. 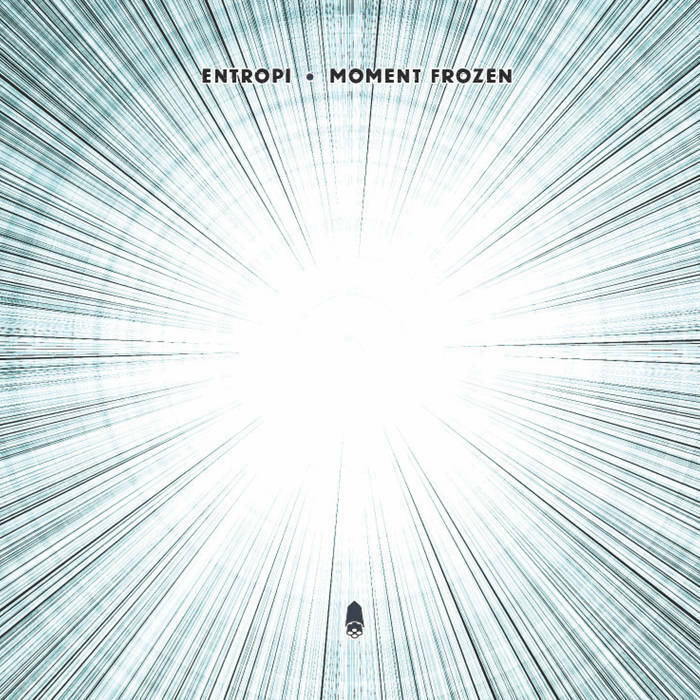 Entropi has grown together as a band, and expression is everything. So the album was created from live, whole takes in the studio – moments frozen”. Described as mirroring our human existence against the five, perceived, transitory stages of the universe, ‘Stelliferous Era’s recurring riffs are blasted into disarray with percussive turbulence; and similarly edgy ‘Interloper’ suggests the stealth of an unwanted intruder, with alto sax both frantically warning and clashing with trumpet against a maelstrom of Rhodes clusters and feisty bass and drums. The piano ostinati of ‘Elst Pizarro’ contribute to a zero-gravity pictorialization of a celestial body whose identity confused astronomers when discovered in 1979, prompting elegant sax and trumpet imaginings; and Byrne specifically describes the elongated phrases in title track ‘Moment Frozen’ as “recreating the circular motion of this [same] comet/asteroid in the asteroid belt, with the horns guiding the unwieldy rhythm section around the circular form”. The unlikely sleeve-note tale behind ‘Fish Whisperer’ offers spatial reflection, albeit with a central, disorderly free section hinting at fusion; whilst the buoyant, open groove of ‘It’s Time’ cruises to Rebecca Nash’s sustained, tremulant Rhodes and a crisp, rhythmic undercurrent from Olie Brice and Matt Fisher. Byrne’s large-scale ‘In the Cold Light of Day’ (“a moment of realization that that something has irrevocably changed”) is episodic and fluent, showcasing her especially fervid approach to alto improv; and the soft catharsis of ‘Leap of Faith’ conveys “fragile steps into the unknown” along elegant, oscillating horn pathways.